﻿ News Bharati - Two marks from a single arrow..! India ranks the entrepreneurship list for solving societal issues..! News Bharati - Two marks from a single arrow..! India ranks the entrepreneurship list for solving societal issues..! Two marks from a single arrow..! India ranks the entrepreneurship list for solving societal issues..! New Delhi, February 2: Everyone can monitor the risks, but its an entrepreneur who tend to see the rewards. Alike an Indian entrepreneur, Ankit Agarwal of ‘HelpUsGreen’ has topped the list of the Best Entrepreneur Award presented by the Takeda Foundation at Japan on Friday. Sanjay Kumar Verma, extant Indian Ambassador to Japan delivered congratulatory remarks at Takeda Foundation annual entrepreneurship award saying that Indian youth’s ability to solve societal issues by applying innovation was recognized. Agarwal founded Kanpur Flowercycling company to collect and convert the floral waste into proprietary products such as florafoam, a biodegradable Styrofoam like material, incense sticks and fertilisers. The company hires poor women to process the waste thus providing them stable employment. “Indian people customarily donate flowers to temples and mosques as a symbol of devotion. The donated flowers reach eight million tons per year and the most of them are discarded into the river Ganga, thus causing great environmental problem”, Ankit explained his work. Across the country, people bring flowers to temples daily, gifts for the gods, blessings for life, for celebrations , totalling to the tune of more than 800 million metric tonnes per year. These flowers are thrown into the Gangas and India’s other sacred rivers, a beautiful religious ritual that is having an unfortunate effect. As the flowers rot, they fill the rivers with waste, dumping toxins like arsenic, lead, and cadmium from pesticides, thus causing pollution and enormous levels of water-borne diseases. HelpUsGreen is solving the problem of flower and packaging waste. They have created a compostable packaging using seed paper infused with Tulsi, or holy basil, seeds, and ink made from vegetable dyes. After using the incense or flowers, all the user must do is unfold the paper, bury it in a pot with dirt, water it regularly, and watch the seeds sprout into a Tulsi plant, the statement reported. “The organisation is dealing with flower waste by providing clean, safe jobs for manual workers. Because the flowers have been used for worship, they are seen as sacred and cannot be sent to a landfill. 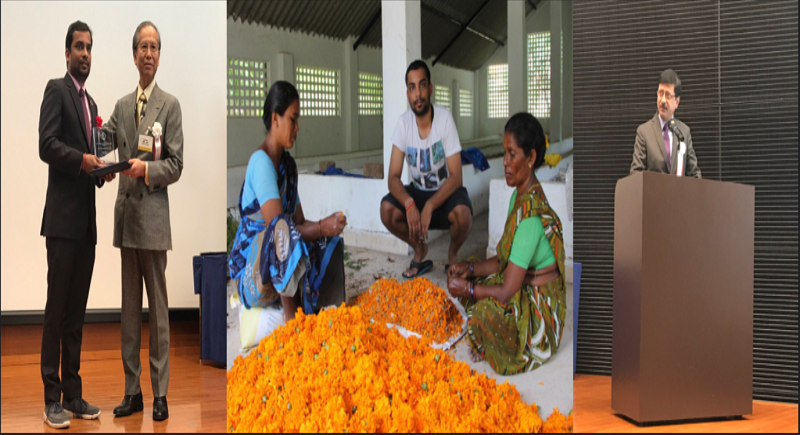 HelpUsGreen works with local women to collect the flowers from the rivers and then upcycles them into compost and useful products such as incense sticks, soap, and vegan leather goods”, Agarwal signed off.